Krishna West Panamá : Durga Puja- A deep Insight! By Shyamagopika dd on Mon, 2008-10-06 13:30. While Durga puja is celebrated in pomp and splendor all over Bengal and other parts of the world, read through HG Jananivasa Prabhu’s wonderful class on the real meaning of Durga puja. Class was on the Bhagavad Gita verse 17.14, where Lord explains about the austerity of the body. 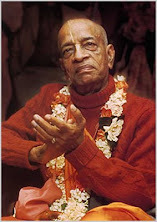 In the purport, Prabhupada writes one should not do anything which is not sanctioned by the scriptural injunctions. Following is the transcription of the class on Durga puja. As long as we are in this material world, it is understood that we are in prison and the head of this prison is Durga devi. As prisoners are given a particular type of uniform, similarly this body, the material body, be it an animal body, plant body or human body, but we have a material body means we have a uniform. This body is like uniform of the prisoners. As long as we have this body, we are under the realm of Durga devi , that means, we are all prisoners. As most of the prison uniforms have stripe marks, similarly, if we mark stripes i.e. tilak marks in this body, which is our uniform, and then we will be prisoners of Krishna and no more of Durga. The external potency Maya who is of the nature of the shadow of the cit potency, is worshiped by all people as Durga, the creating, preserving and destroying agency of this mundane world. I adore the primeval Lord Govinda in accordance with whose will Durga conducts herself. So, she is not independent or the controller but simply she acts under the direction of the Supreme Lord just as shadow follows the substance. She has two sons-Ganesh and Kartikeya- represents mundane success and beauty and that’s why people who wish to be materially successful worship Ganesha. She is seen as standing along with lakshmi and saraswati who represents mundane knowledge and opulence. She carries 20 weapons in her arms, which represents various pious activities enjoined in Vedas. She holds a snake in her hand. This represents the beauty of destructive time. She tramples over the demon Mahisasura. This represents how she tramples over the vices in this world. When Jiva forgets eternal relationship with Krsna, he is put into Durga’s realm and the veil of Karma acts as the instrument for punishing rebellious jivas. Durga’s business is to punish all these rebellious jivas. This is not actually punishment. It is meant for reformation. When somebody is sent into prison, it is not really meant for punishment but for reformation. So, Durgadevi is also having a trident-the Trishul. Trishul represents the threefold material miseries-adhytamika, adibautika and adidaivika.miseries. Every moment in life and everyone without any exception suffers due to one, two or all the three of these miseries. So these miseries are not but trishul of Durga. She is constantly pricking up the jivas with her trishul. But the idea is to wake up the jiva and not punishing. Anyway, Krsna reminds us the misery of this world- old age is coming, disease ,death and it’s always suffering! So, the living entity comes to the point, ‘Why am I suffering’! How can I find solution to this problem? Then he turns to Vedas, brahmanas and Guru to whom he can inquire. Sanatana Goswami, our sambandha guru, when he approached Sri Caitanya Mahaprabhu, he inquired, ‘why am I suffering’? When someone asks this question, human life starts at this point. Then, Vedas and spiritual master can give us knowledge. You are not this body. You are the Soul. Soul is eternal, full of bliss and knowledge. Then spiritual master says, it is not this material world, dear son,it is the spiritual world-back home back to Godhead where you originally belong to. There is no disease,old age and death. How can I perform devotional service? Guru says chant Hare Krsna,be happy and go back to Godhead. So, this is the situation. So, Durga devi, when that person becomes devotee of Krsna, she becomes so happy. Let me help him go back to Godhead. Then that personality who is keeping you here becomes instrument to help you transcend this material world. How? We have all the 33 crores of demigods and they are all present everywhere in the body controlling and she is their mother. When she is happy, seeing the jivas advancement in Krishna Consciousnees, she orders all the devatas to clear from the route. This is what she wants. She doesn’t want to keep anyone imprisoned in this world forever. Srila Bhakti Siddhanta Saraswati Thakur once commented,'Durga Puja is not dancing for hindi songs, taking intoxication and having fun',as we see nowadays in puja pandals. Real Durga puja is to become a Krishna Bhakta. Then Durga will be really happy. 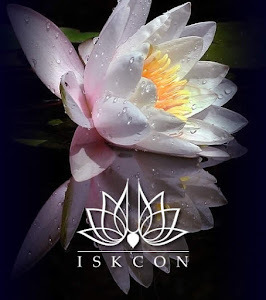 But if we worship her in anyway we like, whimsically, Srila Prabhupada says they are fools. This body is her property. So,ultimately she is going to take over your body. So, they are worshipping her means they are worshipping their own death. So, they are fools. We do not want to do Durga puja as fools but do Durga puja by becoming a Krsna bhakta! Sri Bhagavad Gita ki jai!